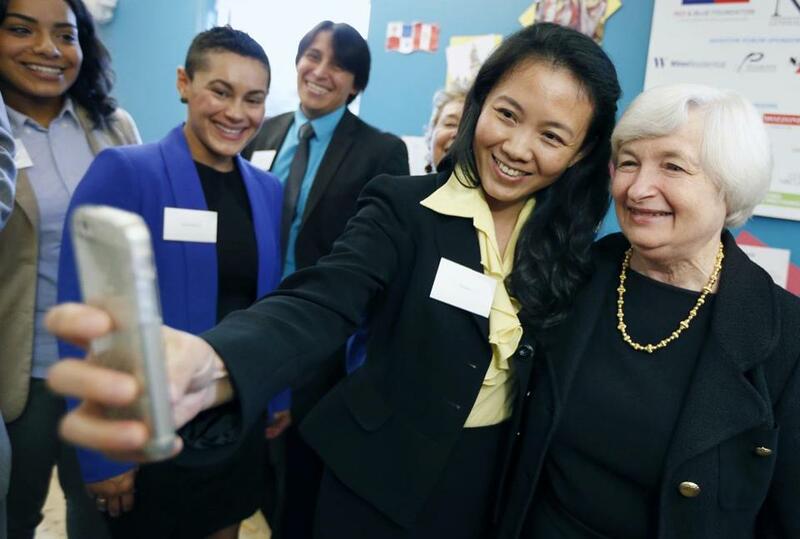 Thao Le-Nguyen poses for a selfie with Federal Reserve Chair Janet Yellen (right) at the offices of Connect in Chelsea. Federal Reserve Bank Chair Janet Yellen visited a Chelsea community services group Thursday to talk with community leaders and hear from Boston residents about their experiences with unemployment, debt, and education. Yellen spent about two hours yesterday at the offices of The Neighborhood Developers, a nonprofit that promotes affordable housing. There, she discussed the local economy with the organization’s leaders and its partners in an initiative called Connect, which matches residents with jobs, resources like public benefits and scholarships, and educational opportunities. “It’s not just about the jobs. It’s about the holistic picture,” said Marissa Guananja, the director of Connect. The Fed chair also listened to eight North Shore residents, including a Honduran immigrant who had never written a check before coming to the United States and a former Marine who got help on his job search from coaches at Connect, discuss their efforts to find work and manage their personal finances. In her half-hour conversation, Yellen nodded along and occasionally interjected questions about the residents’ job searches. Jose Iraheta, 26, a Chelsea resident who immigrated from El Salvador and now works at a bank and a food pantry, said he was surprised to have Yellen ask questions about his efforts to find work. The visit to the resource center was Yellen’s second conversation with workers since becoming the chair of the Fed in January. In March, she spoke at length over the phone with three unemployed Chicago workers about their job searches, which she invoked in a speech the next week.